To be reviewed. . .
Support Okinawan by Eating Okinawan Dishes! Welcome to Chanpuru Review! Chanpuru (or Champuru) is an Okinawan stir fry dish that always contains tofu with combinations of items like goya, pork, spam, egg or moyashi. Chanpuru also refers to "something mixed." What I want to accomplish with these reviews: People are surprised to hear there are so many Okinawan restaurants on Oahu. 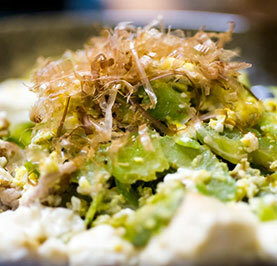 Personally, I think it is great there are places that offer Okinawan food for those of us who don’t cook. We really need to go and regularly eat at these restaurants and prove that Okinawan dishes and drinks are worth having on the menu! With that in mind, I will be highlighting Okinawan and Okinawan-friendly restaurants. In the spirit of yuimaaru, communities supporting one another, please make the effort to go eat at these restaurants!